LEMATEC CORP. is dedicated in "Spray Guns, Air Spray Guns, Paint Spray Guns" with operations in Taiwan. Welcome to Lematec Corp. Our specialists have been dedicated to designing, developing and fabricating tools for more than 30 years. With two decades of experience, we have accumulated expertise in making sophisticated hand tools that satisfy the demands for premium quality from customers in the USA, the EU and other regions. Lematec Corp. has established an integrated production line to handle all the processes in-house to ensure top quality products. 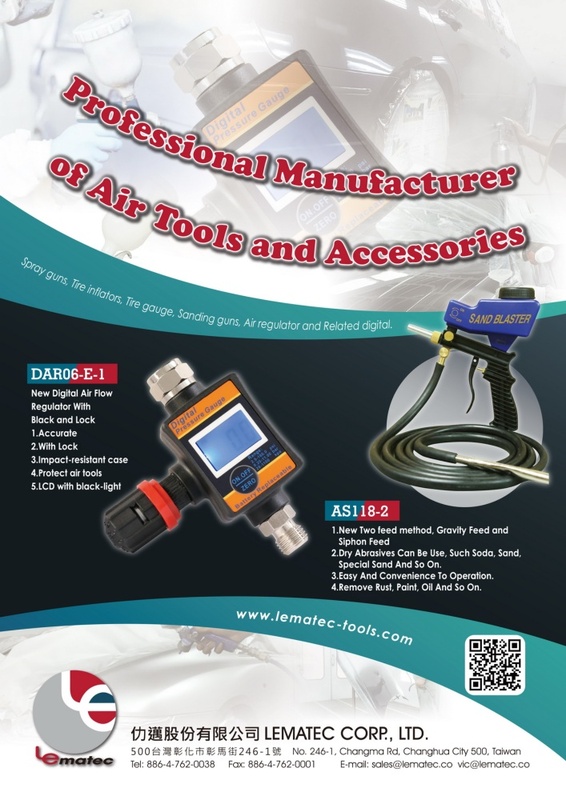 With a variety of spray guns, tire inflators, tire gauge, sanding guns, air regulator and related digital products, Lematec Corp. welcomes your regular orders or requests for OEM/ODM (original equipment/design manufacturer) services. As we have devoted to product innovation and development, as well as our continuous efforts on brand exposure and global patents/certifications acquisition, Lematec is the best hand tool brand you can trust.